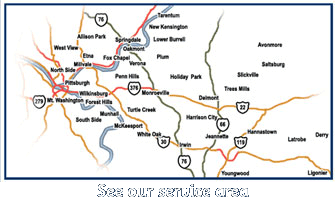 Driveway Dumpsters serves residential and commercial customers in the Pittsburgh area and throughout Westmoreland County. RESIDENTIAL. Our 10 or 15 cubic yard roll-off boxes are ideal for home owners dealing with debris and waste from home remodeling projects, yard cleanup, and more. Visit our Residential Dumpster page to learn more. COMMERCIAL. Small businesses undergoing renovation appreciate the 2 to 7 ton capacity of our roll off dumpsters. The smaller size and maneuverability of our trucks makes Driveway Dumpsters perfect for general contractors performing work in tight areas, or where access to debris is through alleyways or tight driveways. Visit our Commercial Dumpster page to learn more. We routinely provide rubbish and garbage removal service for home owners, landlords, real estate agents, estate executors, general contractors, small businesses, and under contract to other waste disposal services where one or more of our 10 or 15 cubic yard roll-off boxes prove ideal. Everyone has an image of the old-time garbage services, of big, beat-up dumpsters and the rough and gruff service providers of yesteryear. A small dumpster is just the right tool for many applications and won’t break your driveway or your wallet. 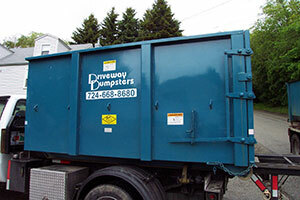 When you call Driveway Dumpsters, you may be surprised at how polite we are, both on the phone and when working with you on-site. We want you to invite us back for your next project, to recommend us to your friends and family. Doing a good job for you, treating you fairly, and leaving you with a smile are the keys to our success.